I’ve often bemoaned the lack of brunch culture in Edmonton, making the joke that Mack and I would be more likely to drive to Calgary to enjoy this meal. 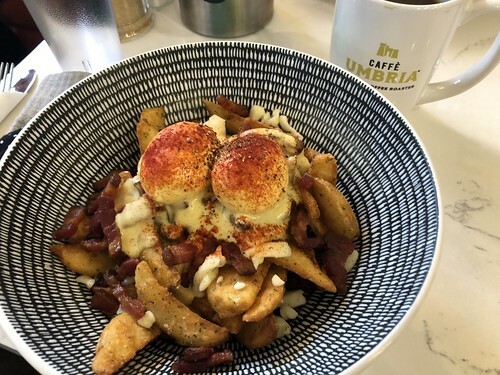 While there are a handful of local restaurants that are known for their brunch service (Hathaway’s Diner and Hap’s come to mind) that number multiplies by several factors when we look to our southern neighbour. So in some ways, given this current vacuum, it’s no surprise that Calgary brunch staple OEB decided to expand to Edmonton. OEB is on a mission. Now with a trio of locations in Calgary, they’re not only setting up shop in Edmonton (with a second branch opening next fall on 124 Street in the former North 53 space), but in Vancouver and Scottsdale, Arizona, too. 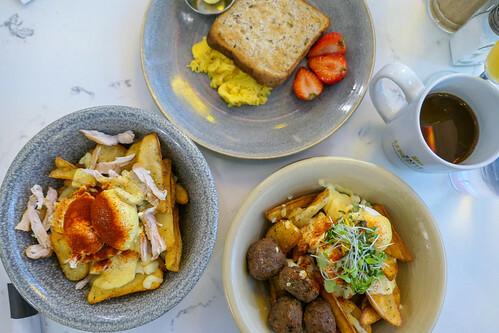 Mack and I dined at OEB’s first restaurant in Calgary back in 2010 when it was still known as Over Easy Breakfast, and though the menu in its current iteration is still daunting, the aesthetics of OEB has changed to embrace a more modern and sleek design. At the end of October, Mack, Emily, and I were invited to preview the first Edmonton location of OEB in the Kelly Ramsey Building on Rice Howard Way. It’s really great to have such an eye-catching tenant on street level. 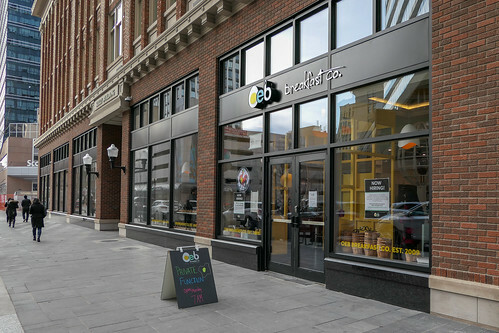 Although OEB prides itself on unique interiors in each of its storefronts, it’s apparent their spaces make the most of natural light, bright accent colours, and egg-shaped decorations. The Kelly Ramsey shop features an open kitchen and pantry, so it feels even more welcoming. It’s fun without being too kitschy, and overall makes it a very pleasant place to dine. The only drawback, perhaps, is that there are few sound dampening measures, so the room can get a bit loud. To say there is something for everyone on the OEB menu is a bit of an understatement, as there are over 50 items to choose from. 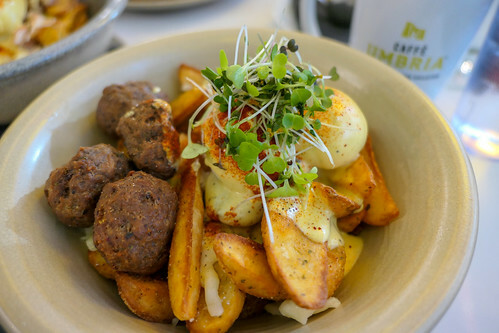 To set them apart, OEB not only has an extensive breakfast poutine selection, but also includes some unusual brunch ingredients like rabbit, lamb, duck confit, black truffles, and caviar. On that initial visit and a follow-up trip, I couldn’t resist ordering breakfast poutines both times. They didn’t disappoint. 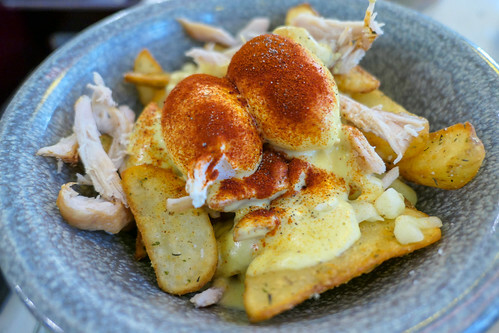 Most poutines are made up of a base of herbed potatoes (half of which could be substituted with spinach if so desired), poached eggs, and hollandaise, then dressed up with a variety of proteins – from the more traditional bacon and cheese curds to the more refined seared scallops and lox. Mack and I shared the Ehhh Itza Meatball ($18) and Chasing Chickens ($17) at the preview. Of the two, the pulled chicken was the better cooked protein, easier to eat along with the potatoes and curds. The Spolumbo’s chorizo meatballs were on the dry side, so digging in to create a complete bite of all of the bowl’s components was a challenge. That said, the eggs were poached to yolky perfection (we were advised by the server to request a medium doneness; apparently at OEB, soft poached means a barely cooked egg with a transparent white), and the hollandaise was delicious. Emily was also treated to her very own kids meal (her first!). 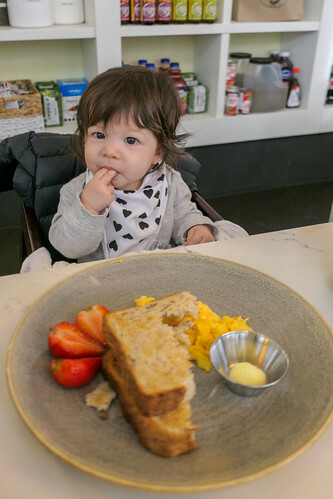 She enjoyed nibbling on the toast and scrambled eggs. Although OEB is equipped with a couple of high chairs, curiously, neither of the washrooms had a change table. When I returned for lunch a few weeks later, I ordered their signature Soul in a Bowl ($17), topped with slow-cooked bacon lardons. Again, the medium poached eggs were consistent with my previous visit, and the potatoes were as crispy as I remembered (Emily enjoyed them, too!). And though I appreciated the generous hand that dealt the bacon, because of how salty they were, less may have been more in this case. At the preview, service (as expected) was superb. On my return visit however, it was equally outstanding. 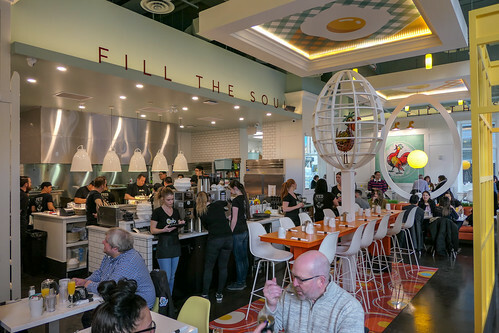 I was particularly impressed with the small details – a shift change had occurred, but the second server didn’t miss a beat, and had already been informed that I was drinking decaf coffee which she topped up without having to clarify. 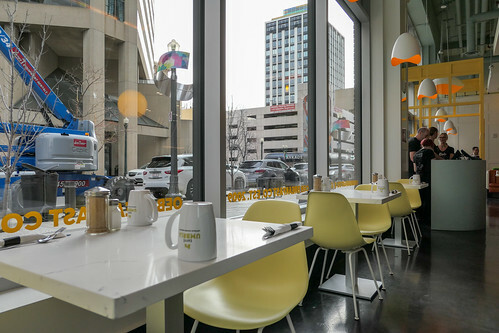 OEB’s entry into the Edmonton brunch market has already made quite the splash; lineups are commonplace on the weekend. OEB does use a waitlist app to help diners manage their time, but the best advice may be to try and avoid peak times if possible – try for an early or late brunch on weekends, or better yet, check it out on a weekday if able. I know I’m already eyeing up OEB as a place to catch-up with visiting relatives over the holidays. Thanks again to Bonafide Media for the invitation to the preview!